A guy emails that he saw a blue Cardinal. What gives? 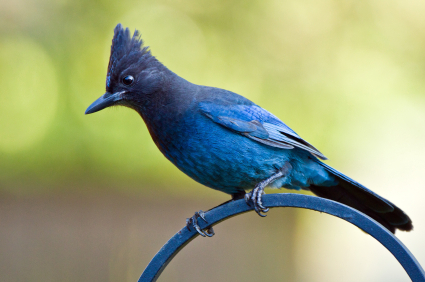 A Steller’s Jay comes to mind. But those birds live three thousand miles west of the guy’s town in Maine. Can’t be. Still, birds don’t always play by the rules. What if a Steller’s Jay took a nap in the back of an 18-wheeler at a Utah rest stop? The trucker drives off and four days later the bird flies out in Maine. Or… Maybe a guy in Maine is spray painting his garage blue. A Cardinal flies through the spray. Unthinkable? Okay. Two theories so far. Maybe the bird’s a hitchhiking Steller’s Jay. Or it’s a red Cardinal that got painted by a spray gun. FOOTNOTE (May, 2017): The above post was written in June of 2012, and seemed interesting at the time. How could a Steller’s Jay be so far out of its range? We have no idea what’s going on. Are these all Steller’s Jays? Are they really blue Cardinals? This is a question for experts. If an expert should happen to stumble across this post, and see the comments below, perhaps that person will shed some light on the subject by contacting one of the active birding websites. There are plenty of such sites out there. But the real question is, are there plenty of blue Cardinals out there? Meanwhile, thanks for your observations. This entry was posted on Wednesday, June 20th, 2012 at 11:20 pm	and is filed under "Daily Sightings" A Blog. You can follow any responses to this entry through the RSS 2.0 feed. You can leave a response, or trackback from your own site. I saw what appeared to be at first glance a female red cardinal on the top of a tree in northern Minnesota, problem is I’m pretty certain cardinals are solitary birds (& this was in a pack of 8 or 9 identical birds) and are NOT the size of a bobtail quail. All the woodpeckers would have migrated south for the year (its mid February), so any idea what I saw? A ptarmigon perhaps? I live in Central Fl and I saw a blue cardinal. Yes, I said it! I haven’t seen too many red cardinals around here though I know we have them… We have tons of blue jays and this bird in particular looked nothing like the other Blue jays. This bird was larger, solid electric blue with no lining around the eyes and there were no other noticeable colors on the feathers. It looked like the very large/bright colored red cardinals that you would see in Virginia, except it was electric blue…Needless to say I knew what I saw and ran to grab the camera, but he was gone before I got back. I was literally 2 feet away from it so I know what I saw, but I just can’t seem to wrap my fingers around it. I have compared pictures of scrub jays and steller jays, but not it either. A birth defected blue jay was my best guess. I do live in Fl…Are there any tropical birds that may look like what I described, maybe it was someones pet? I’m still baffled, but to see is to believe. I live in El Paso, Texas and I have two in my backyard! I confirm that what the man saw was stellars jay, I see them all the time on my property in puget sound washington. I thought the same thing when I first saw them, “blue cardinal”, but after googling for a blue cardinal, I find pictures of the bird with the caption “stellar’s jay”. Also, stellars jays are common permanent residents on the west coast, but will migrate further inland during the colder and stormier months of the year, so it is not very farfetched to ser them go as far as Maine or Ontario. Looks photoshopped. Notice the red towards the left side. I have seen several large flocks of birds move into the area over the last two years in Santa Fe, NM that I have never seen here before. Among them is a blue bird with a very dark indigo almost purplish head that resembles a cardinal. My opinion is they are some type of jay as they appear to me to have a slightly longer, narrower beak. Maybe these birds are migrating? I live in North Carolina and I saw a blue cardinal this June 2013. There was no mistaking that it was a blue cardinal. It was less than 15 feet away from me. My wife and I live in Washington State in Bellevue, near Seattle. We have 3 of these birds (the one posted in the blog entry) living nearby. They eat peanuts and sunflower seeds off of our balcony. They desperately try to eat from the suet we always have hanging, but cannot manage attach themselves to the suet cage to feed themselves. The ones we have come around are identical to the picture: cobalt blue body, and black head and the head feathers stand up same as the photo. Sorry, we are not your typical bird-watchers, but we feed all of the local birds we have nearby and enjoy watching the ones that feed from our balcony close-up. There is even one small woodpecker variety(?) that will come and feed from the suet, while I am a foot away, and kind of talk to me in his little chirps while he eats. I think one-day he may eat out of my hand as he is so use to me. So, does anyone know exactly what kind of bits this blue cardinal is yet? Or at least the one in the picture above? I just saw a bluish purple bird with the shape of a cardinal. Even sounded like a cardinal. I live in Arkansas. Any idea? My wife swears she saw a blue cardinal as well. Unfortunately I didn’t see it. We live in West Texas well out of the range of any blue jays. Apparently the immature Dessert Cardinal females are in fact blue. Believe it or not…I just saw a blue cardinal outside the kitchen window in a bird feeder. Couldn’t get the camera fast enough, but have it ready now. Thought it was just a dark male cardinal at first, but it had the same black markings around its beak, same beak and shape as a red cardinal. It did however have a touch of red on its feathers, but by and large was almost entirely blue. I’ve been feeding birds for years here on the farm in Southwest Virginia. The farm sits outside a series of woods and fields, and I’ve never seen a bird of this color or markings. It was no bluebird or bluejay. It was a blue male cardinal. Mother Nature never ceases to amaze. My daughter and I saw a bird in Riverside Park on the Upper West Side in November, I think….in the Fall. We were feeding peanuts to the squirrels, and it came down to take one. It followed us from tree to tree and kept feeding. I looked it up later, and it was a blue cardinal, not a jay. Some months later, and here is where noone will believe me: a friend went to a psychic who told her the name of a close family member of mine who had recently passed. She said to tell me that she was there with the blue cardinal. Is there anyone out there who will believe this happened? here’s what I say. I’m an old farm girl from Ohio and I have seen those Blue Cardinals HERE in Ohio as recently as last year. IDENTICAL to a cardinal only a brilliant cobalt blue. NOT a bluejay (I am not a fool, nor ‘confused’). They DO exist, I want to know what they are. What I saw wasn’t a ‘Stellar Jay’, either. It was a BLUE CARDINAL. He was absolutely gorgeous. My biology professor seems to think I’m confused, but he’s my daughter’s age; I know what I saw. It even had the identical little black eyemask a Cardinal has; a beak like a cardinal (only BLUE). Just sayin’. What are they, and where do they come from? It makes perfect sense that a Cardinal type Bird could flourish here in Ohio since Cardinals are THE State Bird here. However, I have never seen a blue one til last year. Well, call me crazy, but I would swear there is a blue cardinal that feeds from one of my bird feeders. I have spotted him twice, and today I happened to have my cell phone and was able to take a picture, which I would be happy to share. My sister, who lived in Augusta, GA, had a purple cardinal that frequented her feeder. She named the bird Elizabeth. It was gorgeous. It certanily looked like a cardinal. I do know it was not a bluejay. It had the same shape, relative size and beak as a cardinal. So, am I absolutely totally wrong? I’m not sure what happened, but he’s in MY backyard now so I’ll ask him! What to see a photo? This blue Cardinal thing continues, with Sherry’s comment July 3, about a post that ran June 20. Something must be going on. Meanwhile, we were sent a photo of a blue Cardinal the other day, along with a story. You can see it in “Shorts from Readers” …. It may not put the issue to rest, but it’s worth a look. I just stumbled onto this thread by searching blue cardinal. I live in Huntersville, NC. My husband and I were walking our dog yesterday morning around the neighborhood and swore we saw a blue cardinal. It wasn’t a Stellar’s Jay or a Blue Grosbeak. I just looked them up in a bird book and it didn’t look like that. I’m no bird expert though and the sun wasn’t shining on it to see it more clearly. Just know what we saw. Sure wish I could find out what it was! We’re going to walk that way over and over until I see that bird again!! This guys name wasn’t Timothy Leary was it? Actually… I have seen a “blue cardinal” as well. I know all you birders out there think that I may have a “bird brain” but it was truely a weird experience and I haven’t been able to find a picture of the bird I saw since. Unfortunately, and this is when all you birders are going to sigh or roll your eyes in disbelief, when I went to pull my cell phone out to snap a picture, it startled the poor bird and it flew across the pond and out of sight into the woods on the other side. This sighting took place in Wexford PA in 2011. Now if any of you can shed light on this I’d welcome the input but I want to make it perfectly clear that birds song I was intimately familiar with and it DID sound like a cardinal I wouldn’t mistaken something like that. So what do you think? Anomaly? some bird that mimics other’s songs? We have had birds that are not usually found here in SD. Scarlet Tanager May 13, 2004. Red Crossbill June 20,2004. Scotts Oriole … I think that sometimes maybe their radar gets messed up. Anyway it could be caused from a dozen different things. Enjoy your web site “Two-Fisted Birdwatcher”. I think he was mistaken and saw a Blue Jay or a Blue Grosbeak. Many people don’t know much about identifying birds correctly. They just look at colors not beak size shape, etc. I recently was birding at the beach here and people were asking me if I was watching the Snowy Egret that was standing tall and how big it really is. I corrected them telling them that what they were calling a Snowy Egret was really a Great Egret. They would also get Piping Plovers mixed up with Killdeer. Some people just don’t pay that much attention to details. Blue Grosbeak, as Elizabeth said. Love the blog – it’s the only one I take the time to read. I love being reassured that I’m not the only one who birds. I think he just saw a cardinal that really, really, needs to get lucky! Sorry, not a witty answer….I think he saw a Blue Grosbeak, (Passerina caerulea), in same family as Cardinal. Actually, red reflects in the red spectrum. Heat being infrared, I would think it would reflect, if anything. On the other hand, blue in birds’ feathers reflects only light in the shorter wavelengths (scatters is more accurate, but there’s no point in getting into tedious detail). Infrared, being a longer wavelength, would be absorbed, as the particles that affect the blue wavelengths have no effect on light at the other end of the spectrum. Jeff is right. The Blue Cardinal is an adaptive mutation, nature’s way of repelling heat in an increasingly hotter planet. Red absorbs heat. Blue repels it. Soon we’ll see other evolutionary changes: Blue apples, blue tomatoes, bluer blueberries, and deeper, darker mood indigos. I think the cardinal was flying north from TX and when he hit that Maine weather he turned blue! Besides that it was probably a blue jay. Lobstermen in Maryland recently found a bright blue lobster. A natural genetic anomaly that occurs in about 1 in 2 million lobsters. I’ve seen one myself in an aquarium in Maine. Nature plays dice. I prefer to think he saw an actual, true Blue Cardinal. A one in a billion genetic wonder. And I’m glad it ain’t in no museum! Pretty simple, I think…this cardinal has switched parties — from Republican to Democratic. Okay. There is no such thing as a blue Cardinal unless it’s an unhappy guy at the Vatican. And, if he was adamant about it being a Cardinal it had to have had a crest. All of that limits it to the two suggestions already mentioned. … A Blue Jay or an errant Stellars Jay. So, unless this is a Stellars who decided to leave for the summer while the fires rage in his backyard, my vote is the Blue Jay. Most importantly however, I agree with the previous comment. Great blog. Love reading your thoughts and insights! My guess is that he saw a Blue JAY and just got confused. Maybe the man is color blind? Blue Jays and Cardinals are similar enough in size and shape (I mean they both have a crest) to where they could easily be confused if someone was colorblind. Another thing to consider is that this guy might be really, really new at birding. I am shocked every day by how few people even know the names of really common birds, like Robins. It could also be a Stellar’s Jay. Yes, the bird would be 3000 miles away from home, but, hey, crazier things have happened! I love your blog! Keep up the great work!